Eunice Kennedy Shriver (July 10, 1921 – August 11, 2009) was a leader in the pro-life movement and the younger sister of President John F. Kennedy. She was influential in creating the first International Special Olympics for athletes with intellectual disabilities. After graduating with a Bachelor of Science degree in sociology from Stanford University in 1943, Kennedy served in the Special War Problems Division of the Department of State, and later headed a juvenile delinquency project in the Department of Justice. She was a social worker in the 1950s for Penitentiary for Women. In 1953, she married Robert Sargent Shriver Jr., they had five children; Robert III, Maria, Timothy, Mark, and Anthony. 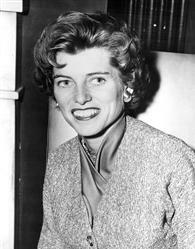 After actively campaigning for John Kennedy in 1960, Shriver began her work with the disabled in 1962 when she launched a summer day camp for children and adults with intellectual disabilities. In 1968 she planned the first Special Olympics summer games. Additionally she founded the National Institute of Child Health and Human Development (NICHD), which establishes health care facilities throughout the country. Kennedy became the first woman to have her portrait appear on a U.S. coin during her lifetime when she was on the 1995 commemorative Special Olympics silver dollar. Although a Democrat, Eunice Kennedy Shriver was pro-life regarding abortion. She was a longtime supporter of Feminists for Life of America. In 1972 she proposed a campaign called "One Million for Life" to recruit 1 million people willing to adopt unwanted children. This page was last modified on 11 July 2016, at 20:17.